Holiday meals like these can wreak havoc on a diet but they sure are yummy! Indulging over the holidays is a tradition for most people. But our dogs are also at risk of putting on a few lbs. right along with us with all the goodies that accompany the holiday fun. Why not get a head start on fitness New Year resolutions by eating right and keeping up exercise routines NOW. And better yet, here are five things you can do WITH your dog to stay in shape so your holiday finery will still FIT! Make sure both you and your pup have access to plenty of fresh water. Not only is water essential to live, but it also can help keep you from feeling hungry. Try using a pet fountain for your dog. It'll help keep the water fresh and we find the sound of the trickling water relaxing. Check out this new Pagoda fountain in blue from PetSafe. We've all heard that it takes time for your body to signal that feeling of fullness. Eat slower to help you eat less, and help prolong your pup's meal by using an interactive or slow-feeding bowl . Just because the weather is cooler doesn't mean you can't enjoy some outdoor time with your pup. Dress warm and get out and walk through your neighborhood or through one of your favorite parks. The fresh air will do you both good! And, it's a good excuse to buy a new coat for your pup. We love this Hurtta Winter Jacket . Keep your pup busy and get the benefit of some leg work by teaching your dog to weave through your legs. We like to do this while moving forward... picture doing walking lunges while your dog weaves in and out of your legs. You may need to use some healthy, low-calorie dog treats to encourage your pup at first. Rocco also loves to snack on frozen green beans, right out of the freezer! Consider a holiday gift both you AND your dog can use. I love our K9FITbone for its versatility. 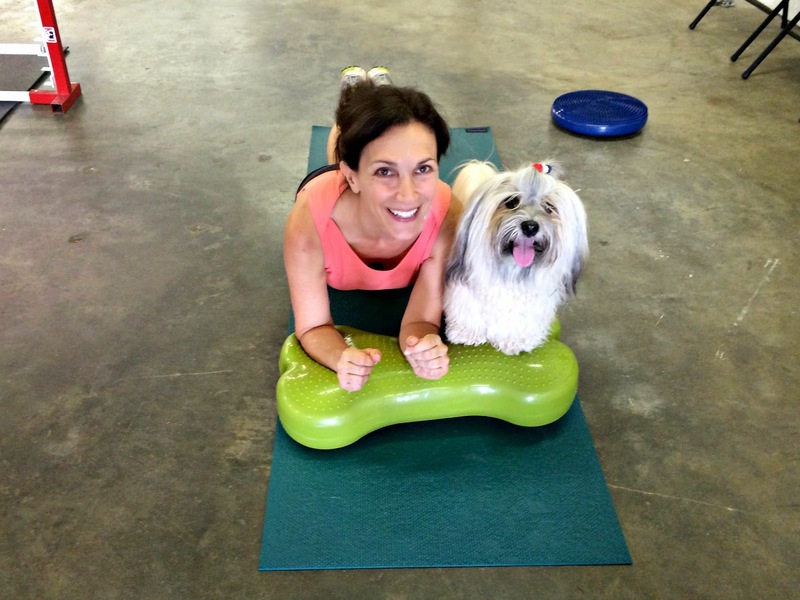 Rocco can use it for balance, rear-end awareness and core strength training, and I can use it too! Rest your forearms on the bone for plank exercises or rest your feet on it and perform hip lifts while the movement of the K9FITbone underfoot provides an extra challenge. If you're visiting friends or relatives with your dog, it's also super important to keep an eye on what other folks are feeding your dog. Ask them to please NOT feed unless it's something that you have approved. Those extra bits of holiday food can add to holiday weight gain and uninformed people may feed something that can be harmful to your pet. If you have any holiday tips to stay fit and avoid weight gain, let us know in the comments below. I was worried that the jacket was a little too sporty looking but Mr. N makes everything look dainty lol. I like it a lot. What size is Rocco wearing? He's wearing a 17 inch! It's probably an inch too long, but he still seems comfortable in it. Great tips and we will go for extra walkies which is an added bonus. Have a fabulous Friday. Happy Friday to you, Molly! We always opt for more walks and runs when we eat too much and it works for us. The fresh air is healthy too after being cooped up inside a lot in the winter. We agree! We feel much better after a good walk! Sounds like Taffy's off to a great start! Dolly, you'll be a great coach! I love winter hikes, especially when there's snow on the ground. It's nice to stay inside where it's warm, but once you get out there and get walking, it can be a lot of fun. It is nice once you're out and going! I like the crunch of snow underfoot before it gets all slushy and messy! Excellent suggestions. We do try to get out with the dogs and work them even over the holidays. The lack of daylight is our issue.